Nakeya wants to be a ballet dancer. Jamari wants to be a train conductor. Isabel wants to design fashions for famous people. Deandre wants to be an astronaut. Phillip wants to be an animator. Kenyatti wants to produce videogames. For these second-graders at Lincoln Elementary School in Bellwood, these aspirations are not just dreams. Even better, these life goals are thoroughly thought through, not just quick answers spouted in response to the eternal question asked of children about what they want to become when they grow up. And, thanks to support from students in the NIU College of Education’s Open Doors project, the children have drawn roadmaps of the steps necessary to achieve their visions. 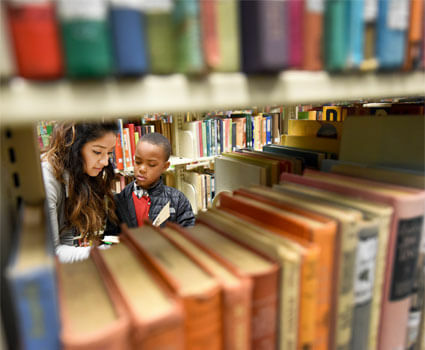 An NIU pre-service teacher and a second-grader from Lincoln Elementary School explore NIU’s Founders Memorial Library. “Nine out of 10 times, the students’ visions involve college,” says Natalie Young, an instructor in the Early Childhood Studies program of the Department of Special and Early Education. 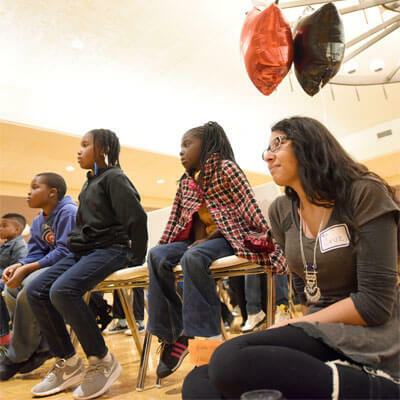 And that, Young says, is important for these young students to understand: “From our visits, we have learned that there are children at Lincoln who already doubt that higher education is a possibility for them,” she says. 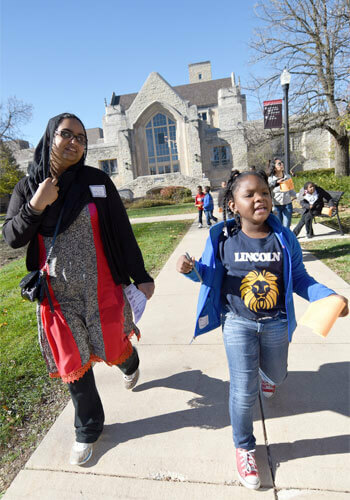 It’s a notion that Open Doors is working to dispel, and it’s why Young arranged for the children’s Nov. 10 visit to the NIU campus in DeKalb. Young’s students, all of whom are seniors in the Early Childhood Education program, see the potential of all the students they work with at Lincoln. the steps necessary to achieve those dreams. Close to lunchtime on a late October morning, as the Lincoln children present their “vision boards” in front of the class, students eagerly talk of becoming nurses, doctors, choreographers, professional athletes, police officers and military service personnel. Many want to become teachers; that’s Ashtyn’s plan, too, but it’s just the first rung on the ladder toward becoming a principal. At Lincoln, where 80 percent of students are African-American, in a school district where 80 percent of students are considered low-income, setting the bar high is an important mission. A hallway illustration tells students just who – and what – they are. Educators. Artists. Creators. Scientists. A friend. Bankers. Thinkers. Important. Authors. Engineers. Lawyers. Leaders. Explorers. Loved. 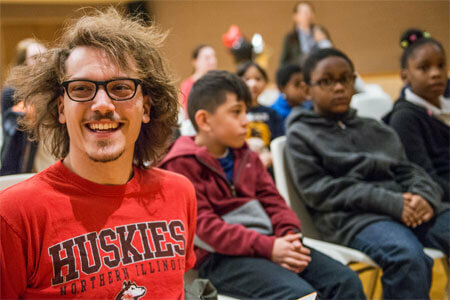 Second-grade teacher Terrance Thomas believes the pre-service teachers from NIU offer positive affirmation through reinforcing those “Yes I Can” phrases the Lincoln children see every day. Raised in Bellwood, she attended Lincoln as a child and returned to teach there after earning her bachelor’s degree from NIU. Warm hugs from her former colleagues are abundant as she travels the hallways and pops into classrooms and the main office. It’s clear that they deeply love and miss her. Her return to DeKalb provided an additional mission. 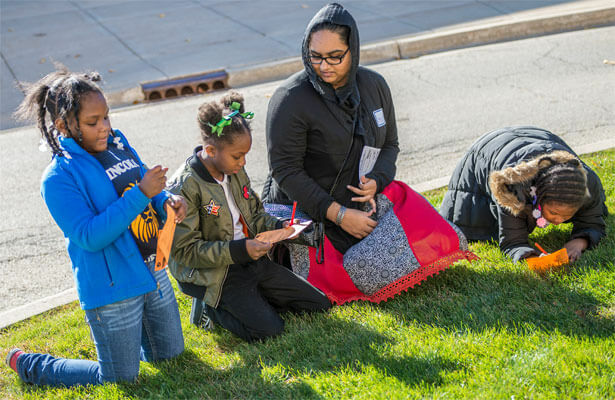 No grades are on the line during NIU students’ Open Doors experiences – just reflections, class discussions about the experiences, and feedback. Neither a clinical experience nor a student-teaching assignment, Open Doors is an early chance to practice in primary-grade classrooms. 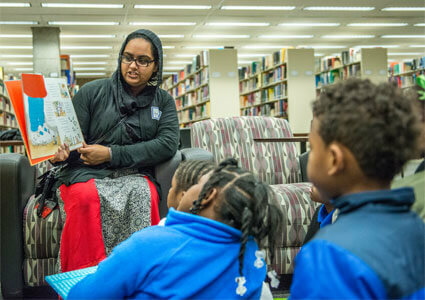 Yazmin Nambo, from Rochelle, believes it’s important for pre-service teachers to glimpse the full picture of Pre-K-12 schools – something Open Doors has given her. “I’ve really enjoyed it; it allows students to see a different view of education and to experience the diversity of an urban setting,” Nambo says. Indy Douglas – “Mr. D.” is the only man among Young’s Open Doors students – hails from tiny Coleta, Ill. Although the rural town’s population is only 140, that doesn’t mean Douglas wasn’t “blessed with so many wonderful teachers” during his childhood. Now that he is almost ready to join their ranks, he finds that his preparation is well-rounded. Danielle Wicks, from Carol Stream, offers an atypical perspective than contrasts with others on the bus to Bellwood. The daughter and granddaughter of teachers exclusively plans to work in a community like Bellwood, even if that goal might worry some in her family. “I actually grew up in a low-income household, and I’ve seen what a difference teachers can make. 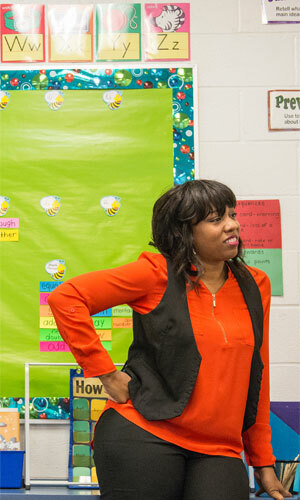 I’ve seen how influential teachers can be; how the kids just gravitate to my mom and trust her,” Wicks says. Natalie Young already has expanded the scope of Open Doors, which she launched in 2014. 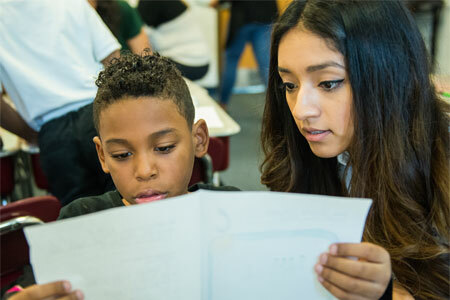 Previously dedicated only for seniors, who make four trips each fall to create the vision boards with second-graders, the program now also takes juniors to Bellwood in the spring to work with first-graders on student-specific needs. Lincoln teachers provide “amazing feedback” and gratitude, Young says, but she finds true affirmation from the mouths of the children. “The Bellwood kids love, love, love when we come. It’s always, ‘Will we see you next week? When are you coming back?’ ” she says. Following the final visit, after the children have completed and presented their vision boards, after goodbyes have been said, Young asks her NIU students to reflect. 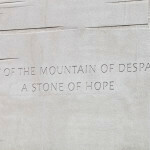 The reflections please Young, who finds in them (and the Lincoln trips themselves) a reassurance of her purpose and the motivation to continue. And what should her students learn?